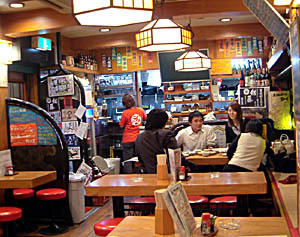 Superlative izakaya-style fare in a lively, noisy setting. They have an impressive and ever-changing selection of jizake (regional sake), plus good sashimi and grilled fish. Intriguing original creations include maguro kimuchii yukke, made with raw tuna and raw egg and flavored with kimchee and sesame oil. No English spoken. Charcoal-grilled pork on skewers, udon noodles in curry-flavored soup, octopus dumplings, deep-fried beef cutlet -- there's a whole world of exciting food in Tokyo that food-loving visitors often miss out on. This book will introduce you to more than twenty of Japan's favorite specialty foods that are less well known abroad, along with a guide to the best places in Tokyo to try them and expert tips on what to order. From Bento.com.